4 Covalent vs Noncovalent Immobilization of Peroxidase Active Proteins on PolyMNPs. What Difference Does It Make in the Electrocatalytic Activity and Kinetics? 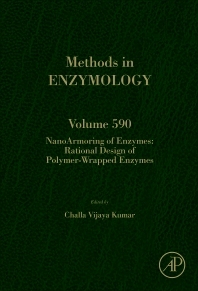 Nanoarmoring of Enzymes: Rational Design of Polymer-Wrapped Enzymes, Volume 590 is the latest volume in the Methods in Enzymology series that focuses on nanoarmoring of enzymes and the rational design of polymer-wrapped enzymes. This new volume presents the most updated information on a variety of topics, including specific chapters on Encapsulating Proteins in Nanoparticles: Batch by Batch or One by One, Enzyme Adsorption on Nanoparticle Surfaces Probed by Highly Sensitive Second Harmonic Light Scattering, Armoring Enzymes by Metal–Organic Frameworks by the Coprecipitation Method, and Enzyme Armoring by an Organosilica Layer: Synthesis and Characterization of Hybrid Organic/Inorganic Nanobiocatalysts. Users will find this to be an all-encompassing resource on nanoarmoring in enzymes.